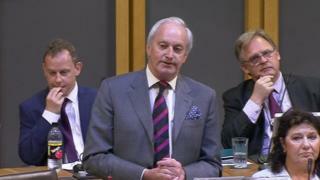 Neil Hamilton has been named as UKIP leader in Wales by the party's newly-elected leader Henry Bolton. Margot Parker will be deputy leader, with Jim Carver and Mike Hookem serving as assistant deputy leaders. Previously, Mr Hamilton had been described as leader of the UKIP group in the Welsh Assembly. A UKIP spokesman told BBC Wales the assumption was he would now have a broader responsibility for the party in Wales under the new title. "That is the direction we are moving into," a UKIP assembly spokesman said of whether the new title will give Mr Hamilton such broader powers. But the spokesman said this was not the case presently, as the necessary reforms within the party had not yet taken place. Mr Hamilton had described Mr Bolton as a "very substantial figure" following his election as UKIP leader in September, in the party's third leadership contest in a year. After UKIP won its first seats in the Senedd at the 2016 election, Mr Hamilton defeated the then UKIP Wales leader Nathan Gill in a vote of the party's assembly members on who should lead them. Mr Gill subsequently left the group and now sits as an independent AM.